How to Quickly Grow your LinkedIn Network - by Connecting to People who Really Want to Connect with You! Would you like to grow your LinkedIn network? Fast? With minimal pain? And by connecting with people who want to do the same? Before I begin I would like to include the following disclaimer: If you get frivolous with your invites, and enough people flag your invites that they "Don't Know" you, your account could get locked down until you beg, wheedle, and grovel with LinkedIn customer support to lift any restrictions. Consider yourself warned. Down to business. Let's grow our network! Keep in mind, LinkedIn does change the interface, so things I mention may move around or disappear. THERE IS A CATCH - YOU MUST OBEY THE FOLLOWING RULE WITHOUT FAIL: You are now becoming an Open Networker. If you call yourself an Open Networker, you MUST accept all incoming invitations. All of them. Even from that pig farmer in Iowa, or that recruiter from New York. Doesn't matter who sends the invites, you need to accept them. To call yourself an Open Networker and refuse any invites breaks the honor rule associated with this. You break this rule, your reputation in the LinkedIn community will suffer. Step 1: Log into LinkedIn (www.linkedin.com). On the top bar, select Profile -> Edit Profile (the one in blue). Step 2: Edit your profile as below, mine is here as an example. The section in blue is known as "Your professional headline". This is what people seeing a brief shot of your profile will see along with your picture. Click on the pencil. 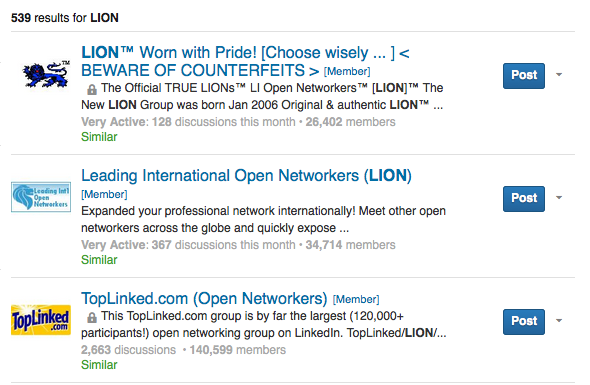 In this field add phrases such as "Open Networker" and "LION" (this stands for "LinkedIn Open Networker" - we'll get to this in a couple steps). Step 3: There are several LinkedIn Groups devoted to helping Open Networkers meet each other, and to essentially announce that they are looking to add connections. On the top bar, select Interests -> Groups. Step 4: In case you are new to this, LinkedIn Groups are meeting areas of common interest. They could be professional, academic, or something else. Click on the blue button midway down the right side labeled "Find a group." This will bring up a box where you can search for groups. In the text box, enter the word "LION" and press the blue "Search" button. Step 5: You will receive a very long list of groups. These groups following here are ones I definitely recommend joining. If you do not belong, there will be buttons on the right which say "Join" (rather than "Post", which is indicated because I belong to these already). Click and these. "Please send me invites - looking to grow my network"
"I am looking to grow my network. I am an open networker, please send me invites to [enter your email address]. Thank you!" Repeat this process in these groups. You probably know this, but what you have just done is announce to the world that you are looking to load up on connections. You will receive invitations from people you don't know. Accept these without hesitation. Take some time to look through posts in these groups. You will find other people posting notes such as yours. Invite them to join your network. Step 1: Go to the home LinkedIn page. On the upper right hand side of the page, hover over the icon with the plus sign and the silhouette. When the text box hovers open, click on the words "People you may know", which is a link to a page of suggested contacts. They have "Lion" or "Open Networker" in their description below their name. You will need to repeat this process on a relatively regular basis to see who new pops up. I recommend doing so daily. Step 1: Add the LinkedIn mobile app to your mobile device. Open the program and log in. Step 2: Click the little blue "in" logo box on the top left corner. Click on the "People You May Know" button. Step 3: Click on the magnifying glass icon. Type in the following: "LION". Step 4: A list of people with LION in their description. You request to add anybody who has the icon below next to their profile. Just make sure you are getting "LION" as in Open Network, and not somebody named Lionel, for example. Step 5: Repeat Step 4, using the phrase "Open Networker". One final note: People can act unpredictably sometimes, and that can include turning down an invitation, even when they've identified themselves as Open Networkers. Be considerate and prudent with your invites.